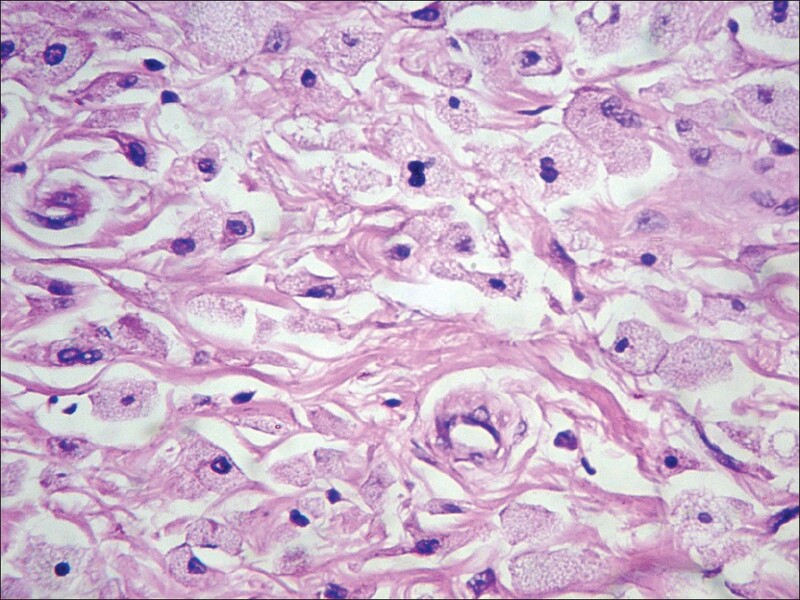 Xanthomas are benign plaques, papules, or nodules characterized by accumulation of lipid laden macrophages that develop in the cutis and subcutaneous tissue. Tuberous xanthomas are firm painless yellow red nodules most commonly seen over extensor aspects of limbs and buttocks. They are seen in several lipidoses and are usually indicative of a derangement in lipoprotein metabolism, in particular familial hypercholesterolemia and are usually not larger than 2 cm. Recently a patient presented with multiple large swellings varying from 2 to 20 cm all over the body. 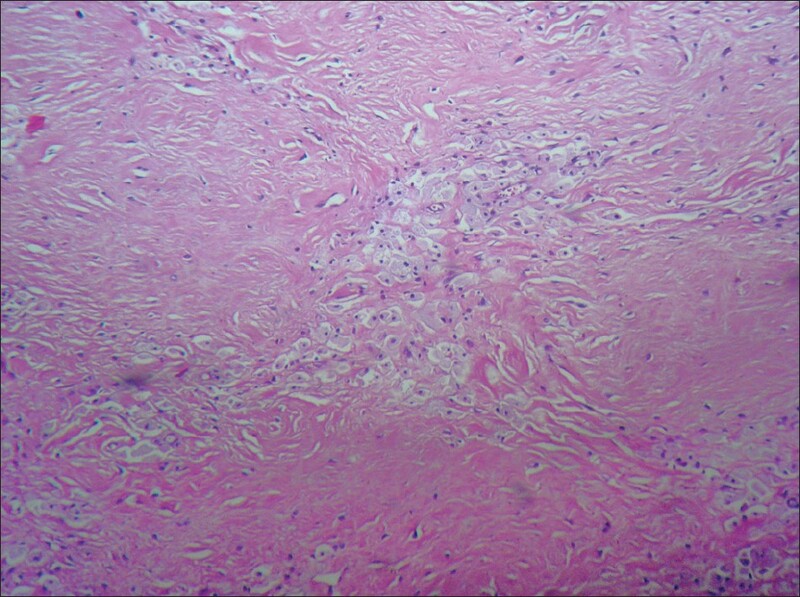 On histopathological examination, these were revealed to be an atypical presentation of giant tuberous xanthomas, which is the first such reported case, to the best of our knowledge. A 26-year-old nonconsanguineous male presented with multiple painless swellings over the body since 12 years with no significant family history. He first developed a swelling over the sacral region that progressed gradually to the present size of 20 cm × 15 cm × 10 cm [Figure 1]. At varying intervals, other swellings developed over his body at varying locations. The swellings were present over the buttocks, extensor aspects of elbows and knees and over the hands and feet and varied in size from 2 cm × 2 cm over dorsum of hands to 15 cm × 10 cm over buttocks. On examination, they were firm, nontender, mobile, and without any skin changes. Family history was unremarkable. Routine investigations including hemogram, X-rays were unremarkable. Fine needle aspiration cytology suggested spindle cell tumor. The sacral swelling was excised with overlying skin and primary closure was done. The gross specimen revealed a firm, homogenous grey white mass. On histopathological examination, collections of foam cells and lipid laden macrophages with areas of fibrosis and cholesterol clefts were found indicative of tuberous xanthomas [Figure 2] and [Figure 3]. Lipid profile was performed that revealed raised levels of low-density lipoproteins (LDL) and total Cholesterol. Triglycerides and other lipoprotein fractions were normal, suggestive of type IIa familial hypercholesterolemia [Table 1]. The patient was started on lipid lowering medications including high dose atorvastatin with niacin. He was also worked up for other systemic manifestations of hypercholesterolemia including atherosclerosis and coronary artery disease. At present he is normolipaemic, and reports a generalized global reduction of the size of the xanthomas, with no development of any new lesions. Xanthomas are lesions characterized by the accumulation of lipid laden macrophages. They occur when derangements in lipid metabolism lead to the leakage of lipids from the vasculature into the tissues, where they are phagocytosed by macrophages. They have also been known to occur in normolipemic individuals. In conclusion, tuberous xanthomas are rarely larger than a few centimetres in size; however, in our patient they ranged up to 20 cm × 15 cm in size. This case was reported for the atypical presentation of multiple giant tuberous xanthomas which, to the best of our knowledge have not been reported thus far. They may be the only indicators of an underlying pernicious condition. Our experience demonstrates that they may present first to a surgeon, and a thorough workup is essential to identify the underlying condition in order to initiate early treatment to prevent later complications. 1. Parker F. Xanthomas and hyperlipidemias. J Am Acad Dermatol 1985;13:1. 2. Mohan KK, Kumar KD, Ramachandra BV. Tuberous xanthomas in type IIA hyperlipoproteinemia. Indian J Dermatol Venereol Leprol 2002;68:105- 6. 3. Cruz PD Jr, East C, Bergstresser PR. Dermal, subcutaneous, and tendon xanthomas: Diagnostic markers for specific lipoprotein disorders. J Am Acad Dermatol 1988;19:95-111. 4. Bhagwat PV, Tophakhane RS, Kudligi C, Noronha TM, Thirunavukkarasu A. Familial combined hypercholesterolemia type IIb presenting with tuberous xanthoma, tendinous xanthoma and pityriasis rubra pilaris-like lesions. Indian J Dermatol Venereol Leprol 2010;76:293-6. 5. Bulkley BH, Buja LM, Ferrans VJ, Bulkley GB, Roberts WC. Tuberous xanthoma in homozygous type II hyperlipoproteinemia. A histologic, histochemical, and electron microscopical study. Arch Pathol 1975;99:293-300. 6. Vermeer BJ, Gevers Leuven J. New aspects of xanthomatosis and hyperlipoproteinemia. Curr Probl Dermatol 1991;20:63-72. 7. Austin MA, Hutter CM, Zimmern RL, Humphries SE. Familial hypercholesterolemia and coronary heart disease: A HuGE association review. Am J Epidemiol2004;160:421-9. 8. Aggoun Y, Bonnet D, Sidi D, Girardet JP, Brucker E, Polak M, et al. Arterial mechanical changes in children with familial hypercholesterolemia. Arterioscler Thromb Vasc Biol 2000;20:2070-5. 9. Nemati MH, Astaneh B. Optimal management of familial hypercholesterolemia: Treatment and management strategies. Vasc Health Risk Manag 2010;6:1079-88. 10. Avis HJ, Vissers MN, Stein EA, Wijburg FA, Trip MD, Kastelein JJ, et al. A systematic review and meta-analysis of statin therapy in children with familial hypercholesterolemia. Arterioscler Thromb Vasc Biol 2007;27:1803-10.